There are several potential causes of dangerous and even deadly motorcycle accidents. Motorcycle accidents are often even more dangerous and deadly than other types of automobile accidents because a motorcyclist has no protection from the roadway and from other vehicles. Read on to discover some of the common causes of motorcycle accidents and how they can be prevented. Drunk driving accounts for almost one in three motor vehicle accidents in the United States. Drunk drivers are impaired and are less aware of their surroundings, dangerous when one is trying to spot motorcyclists, who are much smaller than other cars and vehicles on the roadway. Automobile drivers and motorcyclists would do well to avoid the consumption of alcoholic beverages prior to driving- even a blood alcohol level below the legal limit can result in impairment and diminished attention. If alcohol was at play in your motorcycle accident, an attorney trained and experienced with motorcycle accidents may be able to help prove that a driver was intoxicated and is therefore responsible for your injuries. Encompassing speeding as well, reckless driving is extremely dangerous for motorcyclists on the road. Motorcyclists can find it difficult to avoid much larger vehicles traveling at a high rate of speed, and injuries from high-speed collisions can be catastrophic. Some examples of reckless driving include, as mentioned above, speeding, but also cutting off other cars, tailgating, and driving in other vehicles’ blind spots. A pound of prevention is worth an ounce of cure; automobile drivers can and should slow down, drive with the flow of traffic, and drive predictably. As mentioned above, motorcyclists are at a higher risk of injury by the nature of their vehicle; it has no walls or floor to protect the operator from the outside world, from the roadway, or from other vehicles. This makes distracted drivers a significant danger on the road for motorcyclists. Distracted driving includes doing anything other than driving, and may take the driver’s eyes or even just their attention off the roadway. Common examples include driving while texting, talking on a cell phone, eating, applying makeup, etc. Automobile operators need to keep their eyes and attention on the road to avoid accidents, particularly with unprotected motorcyclists. Another common cause of motorcycle accidents is automobiles making left turns in front of motorcycles, when the driver of an automobile may not even see a motorcyclist that is in the area. This also occurs when a car pulls into the path of oncoming traffic without thoroughly checking to see if the coast is clear. Automobile drivers should take care to watch for motorcyclists, especially when turning. Have You Been in a Motorcycle Accident? Motorcycle accident claims can be complex given the serious nature of the injuries and property damage involved. If you have been in a motorcycle accident with an automobile, you need more than just a personal injury attorney; you need someone with experience in motorcycle cases. 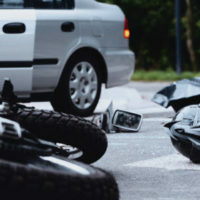 Contact a Columbia motorcycle accident attorney today at The Stanley Law Group. Call 803-799-4700 and set up a consultation.